Today, October 29, the White House issued a statement in support of Houston’s Equal Rights Ordinance, reaffirming support for laws that protect Americans from discrimination based on sexual orientation and gender identity. While the Administration generally does not take a formal position on specific proposals or initiatives, the President and Vice President have been strong supporters of state and local efforts to protect Americans from being discriminated against based on who they are and who they love. 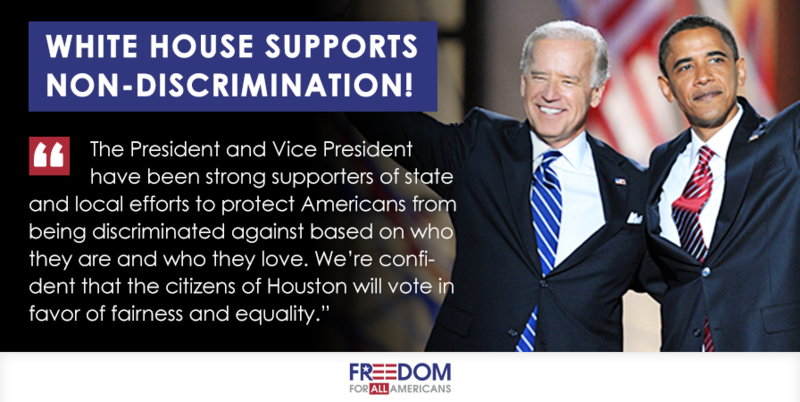 We’re confident that the citizens of Houston will vote in favor of fairness and equality. Freedom for All Americans thanks the Obama administration for its continued strong support of LGBT-inclusive non-discrimination and urges Houston to vote YES on Proposition 1, which would protect Houston’s Equal Rights Ordinance (HERO). HERO protects residents from discrimination based on fifteen different categories, including race, age, gender, sexual orientation, and gender identity. Houston is the largest city in America that does not already have nondiscrimination protections for LGBT people. The majority of discrimination claims (56%) filed with the city of Houston over the last year have been based on race, with 17% based on gender and pregnancy. Freedom for All Americans is a partner of Houston Unites and has been providing communications, digital strategy, field organizing, and financial support to the campaign.